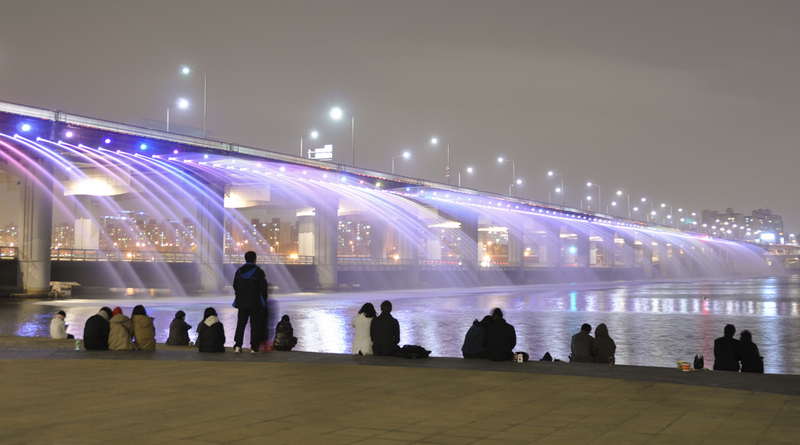 Banpo Bridge (반포대교) is the result of a citywide beautification effort resulting in the world’s longest bridge fountain, coordinating streaming water and lights to music in rhythmic manner. The show plays all week, with peak times being at night. Be sure to check the schedule and directions here and beware there are no shows in the winter. 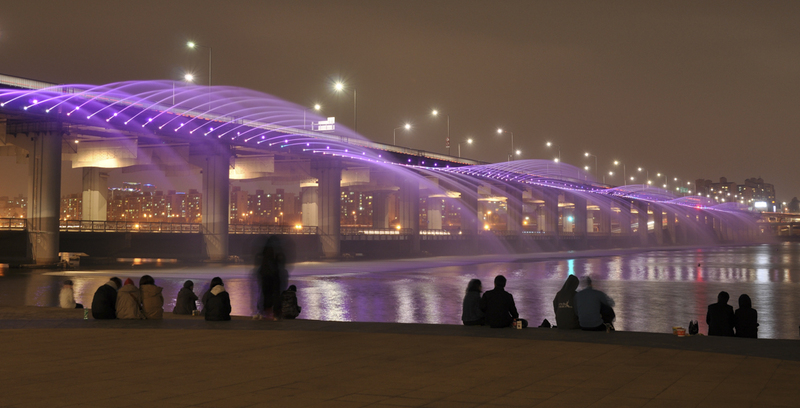 It’s similar to Cheongyecheon Plaza, but is obviously quite a bit more dynamic! The colors don’t stand out too boldly until it gets darker. The bridge itself is interesting because it has two levels, the lowest which is only so high above the river. You can walk under it and check out the action from that angle as well. It was very busy the last Saturday I was there with floods of people watching the show, but it can also be pretty empty at times. Lighting makes the bridge look fairly decent even when there’s no show. A closeup of the LED-lit streams. 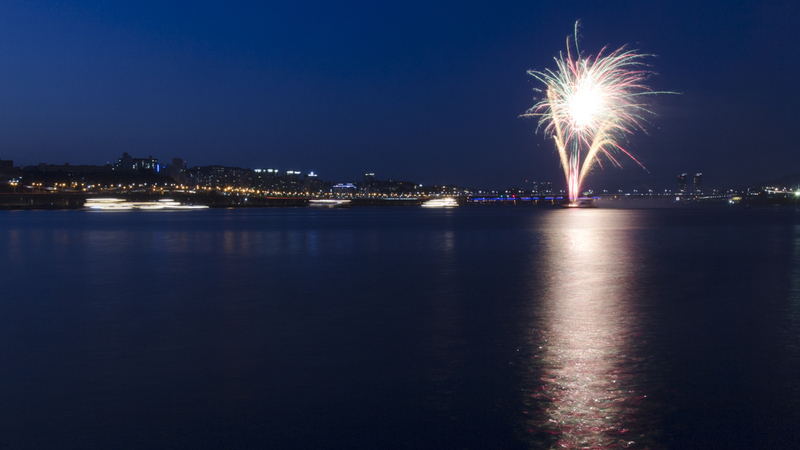 They even had a small fireworks show during the first performance on Saturday (~8pm). Not sure if it was an irregular event or not. but I’d like to think it wasn’t. 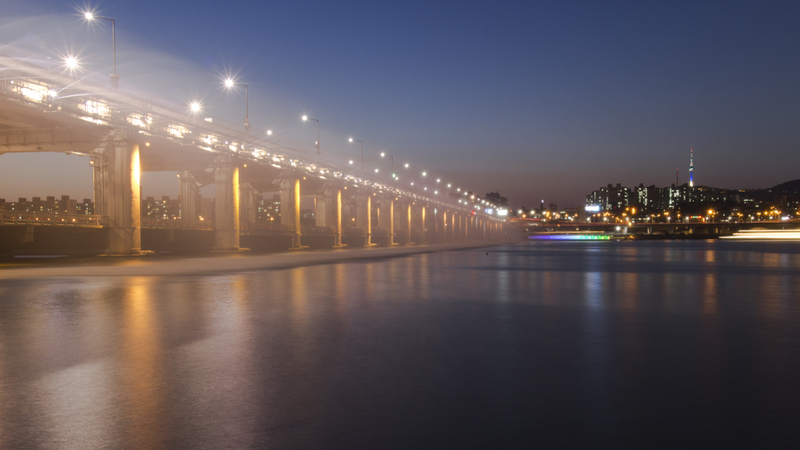 The area is also home to “Some Sevit” which is a complex of buildings floating along the Han River. 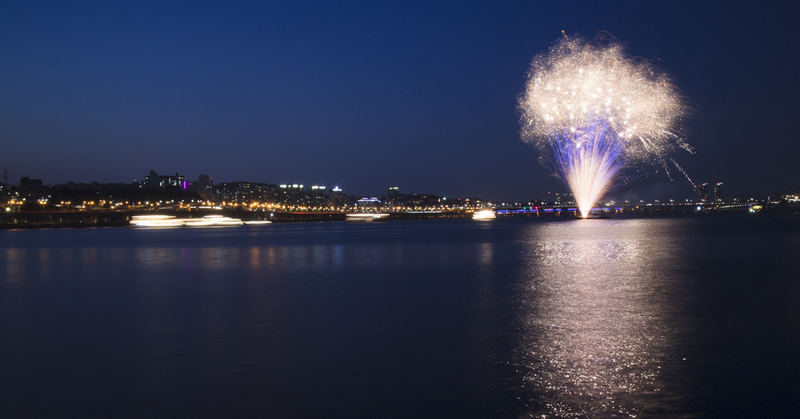 They light up and change colors perhaps even more frequently than the Banpo Bridge itself! It adds even more flashiness to Seoul’s night scene and is home to a bunch of accommodations, including a buffet restaurant! Needless to say this area is pretty cool for people wanting to experience the modern urban infrastructure that shines brightest during the night. They offer parking and is also easily accessible by public transit. It is best to take the subway though as the area gets congested with cars. I learned that the hard way while opting for the bus 😦 . You can check below for random photos to see the various colors that the bridge emits. 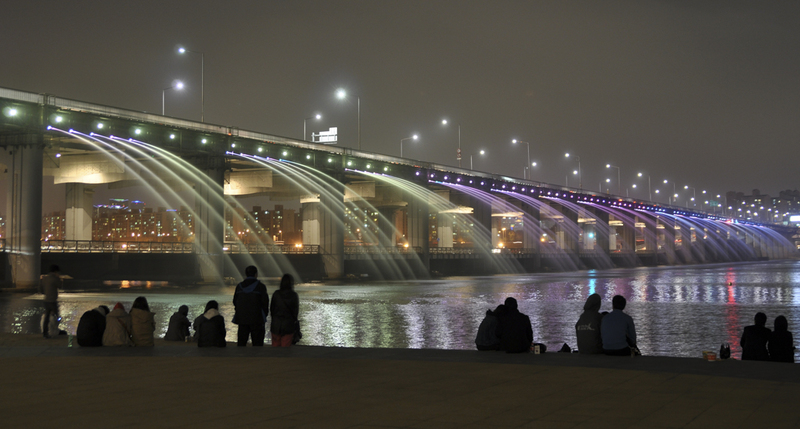 Hi, for the spot to photograph Banpo Bridge’s fountain show, would it be from Seoul’s side or from the other side? Would appreciate directions to get there, as the link above does not explicitly provide the directions. Hi Si Hui! Can you tell me what you mean by Seoul’s side? 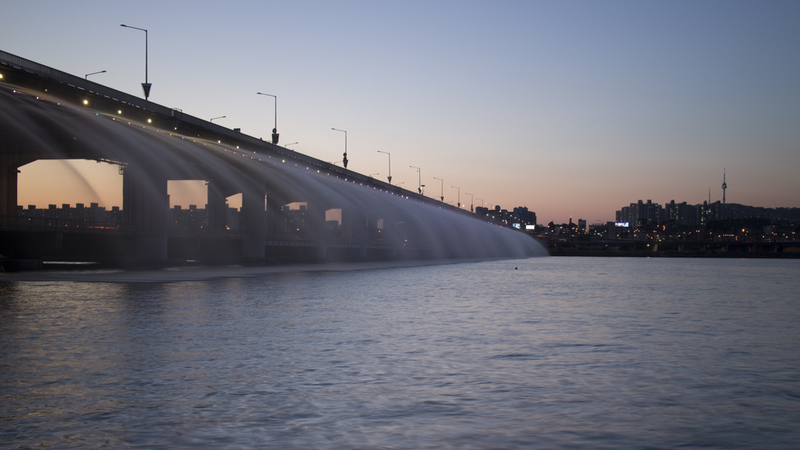 The bridge itself is located in Seoul, so I’m a little confused about your comment. 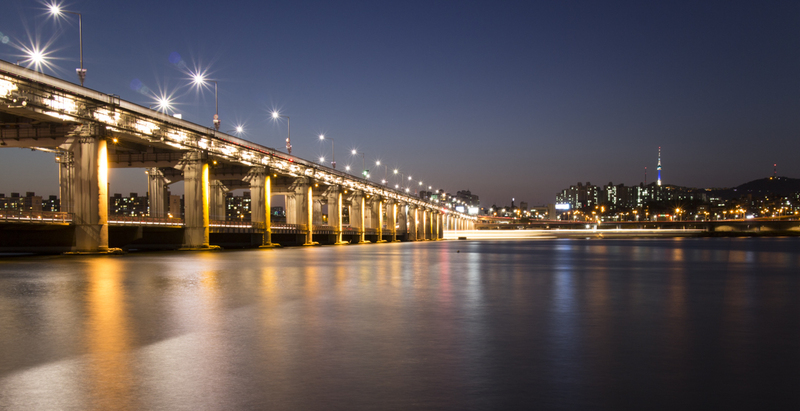 If you type banpo bridge in Google maps and your starting location, you should be able to get personalized instructions on how to get there as well! Hope this helps! Oops, sorry for the confusion. What I meant was whether the spot is on the end where Itaewon/Yeongsan-gu (northern side) is or is it from the other (southern side). Thanks! It’s actually on both sides. it spans throughout the bridge, but I prefer the south end.